Sandwiched between the successful chart runs of ELO's "Telephone Line" (UP36254) and "Turn To Stone" (UP36313) is Jeff Lynne's 1977 debut solo single "Doin' That Crazy Thing" b'w "Goin' Down To Rio" (UP36281). 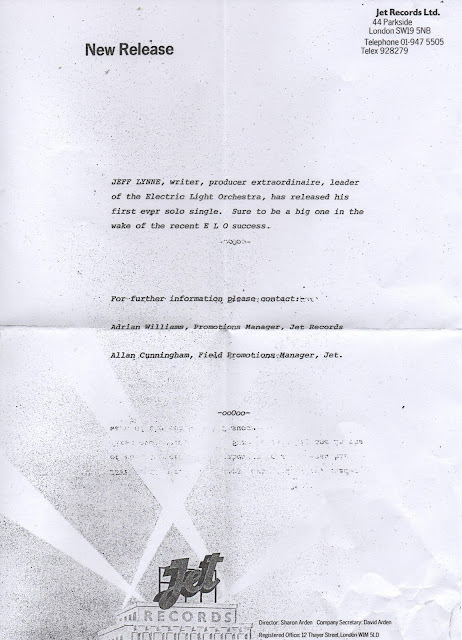 Undoubtedly, it was a departure, musically speaking, from the sweeping orchestral rock of "A New World Record" (UAG30017/JETLP200) and "Out Of The Blue" (UAR100/JETDP400) so much associated with the ELO maestro (ably assisted, of course, by Louis Clark and Richard Tandy) at that time whilst pointing to the change in ELO style and tempo just two years later with their first UK #1 album "Discovery" (JETLX500). There was confidence in "Doin' That Crazy Thing" from Jet Records, as evidenced in the above Press Release, but it followed drummer Bev Bevan's earlier solo effort "Let There Be Drums" (JET777) in failing to chart on either side of the Atlantic (JT-XW1072), despite it also seeing issue as a "SPECIAL DISCO RECORD" (JT-DW1072) in the States with an alternative sleeve replete with dance steps (not unlike the artwork for the much later "Wilbury Twist"). Perhaps it was ill timed with the explosion of punk and a certain reaction to disco or it just did not appeal to fans of the Electric Light Orchestra or the general record buying public. "Doin' That Crazy Thing" was, however, deemed worthy of reissue in May 1978 (SJET102) when Jet ditched United Artists for CBS and also found it included as a 33 1/3 RPM one sided bonus disc (AE7 1220) in "A Box Of Their Best" (Z4X 36966), the 1980 US version of UK boxed set "Four Light Years" (JETBX2). 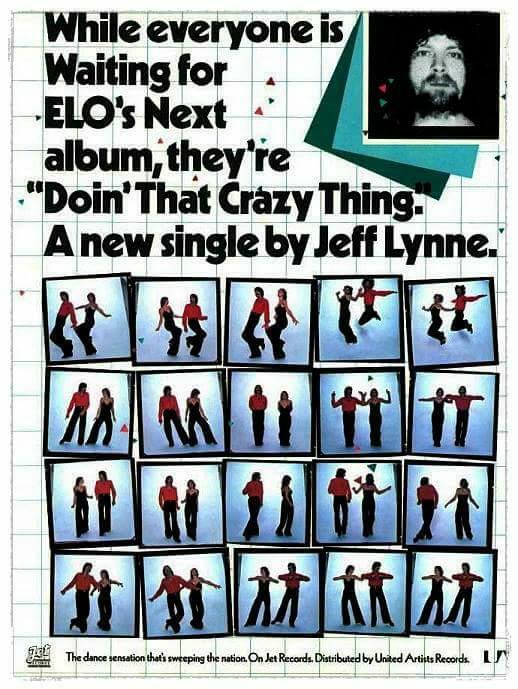 For Yours Truly KJS, "Doin' That Crazy Thing" signposted the reality that the name Jeff Lynne would be more readily recognized behind his sunglasses in ELO than as a solo artiste. 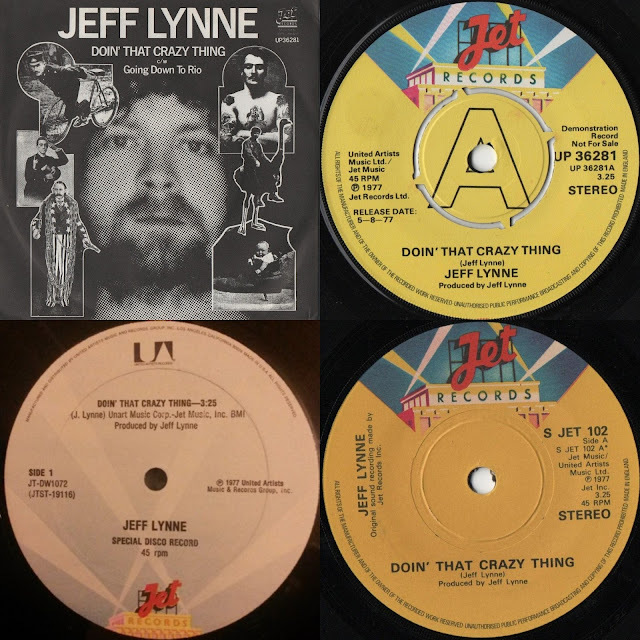 You may wish to also read my elobeatlesforever (elobf) article: Jeff Lynne: The Solo Singles, which chronicles Jeff's solo career in a little more detail.